Sanju director accused of sexual assault - Official statement here! 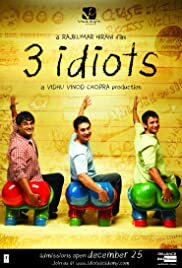 IMDb Quiz: How Well Do You Know '3 Idiots'? Take the IMDb '3 Idiots' movie quiz and test your knowledge of this top-rated Indian film starring Aamir Khan, Sharman Joshi, Madhavan, Kareena Kapoor, and Boman Irani. Beware of spoilers ahead! A short-term memory loss patient sets out on his journey to avenge the death of his beloved girl. Don't be Stupid. Be an I.D.I.O.T. Raju Rastogi: Sir, I have learnt to stand up on my feet after having broken both my legs. This attitude has come with great difficulty. No sir, I can't. You may keep your job, and let me keep my attitude. Q: Which novel is this movie based on? 3 actors from the path-breaking blockbuster RANG DE BASANTI( Aamir, Sharman, Madhvan) team up together with Rajkumar Hirani.. It couldn't get bigger! Loosely based on blockbuster novel ' Five Point Someone ' by Chetan Bhagat the movie deals with the present education system in India that whether getting more marks and better grades is better than gaining knowledge and is mugging up everything more useful than understanding it..
266 of 383 people found this review helpful. Was this review helpful to you?